The trip to my Aunts' to install a new laminate floor last month was successful. My two grandsons: Enoch (14) and Noah (15) helped me and my wife, Frances, with the purchasing, transport and delivery of materials. More on this below. Thanks for the help Noah and Enoch. Noah took the pics. My brother Dan's new site Free Choice Coupons had a problem with the security cert so you might have gotten a warning from your browser. He's got that fixed now. Got my stringer measurements from Dave's Easy Stair Calculator. Run = 6 13/32", Run= 12". Pulled out my Johnson framing square to set rise & run, only to find that there are no 1/32 measurements on the square only 1/8's. How do I adjust the frame for a 13/32 setting? 13/32" is 1/32 more than 3/8". On your square it's a quarter of the space between the eighth marks after the 6 3/8" mark. I'm concerned about the floor's usual dampness. How damp is the floor? Hi Dave. The floor isn't that damp. After removing the old carpet and old linoleum tile the floor is dry, just a little musty smell. After running the dehumidifier the smell goes away. I think with a moisture barrier it will be fine. You can use a floor leveler for concrete. It is a cement based product, put on with a cement trowel. Follow the instructions on the bag. Get the thickest laminate within your budget from 7mm to 14mm. I just installed a laminate floor for my elderly aunts. I used a 12mm thick flooring. Since the floor was over a crawlspace I used a Styrofoam pad with vapor barrier attached. I like the way it stuck to the next sheet beside it. I used a red Tuck tape over the joint, although this was not required. I would suggest using this type of vapor barrier pad on your concrete. The laminate becomes a floating floor. Remember to leave 1/4" all around the walls for expansion. The floor leveling compound comes in a bag to be mixed with water. My local brands probably won't be the same as yours. Just be sure to get the floor leveler for concrete rather than for wood sub-floor. I just buy whatever the local building supply store carries, no problem. With the laminate floor, I prefer the Klick brand, but there are many others. Definitely get the type that clicks together, rather than needing glue between each joint. I didn't even see the glue type, the last time I bought laminate, so that is probably not an issue. Don't even think about buying a thin laminate, like 7mm. The joint itself is not strong. I have found, through experience, that the thicker laminates go together easier. This stuff is made of HDF (High Density Fiberboard) with a plastic laminate finish on top, similar to the plastic laminate of counter tops - Arborite, etc. It should be handled with care. 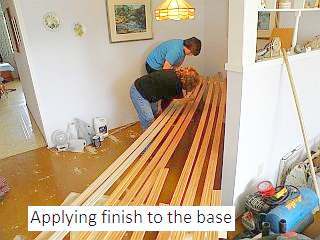 Read the instructions and start laying the boards the right way. I use small pieces of 1/4" plywood as spacers between the laminate and the side wall and between the end and the wall. Some brands let you insert one board at a time, as they lock in place, others require you to attach all the boards in a row together, then tilt them up, as a unit, and click them in place to the existing row. You get what you pay for! Be aware that laminate is a disposable floor. In other words, you cannot sand it down and re-finish it like hardwood. Once it is all scratched up, it needs to be replaced. That been said, it is a very durable floor and will last for years if treated with care. Water and laminate does not mix, so don't wash it with a mop and bucket. Use only a dry mop and wipe up spills right away. 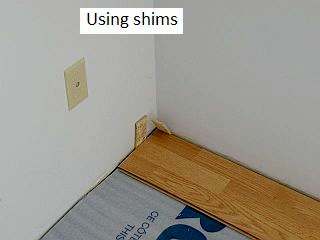 Some installation tips: cut off the bottom of door jambs and casing, so that the laminate will go under the jamb, remember the 1/4" space rule. 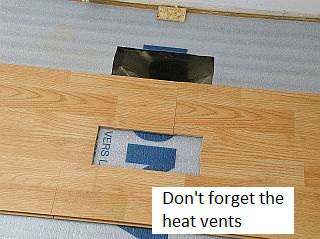 The baseboard covers the joint and keeps the laminate down. The rest of the floor floats on the Styrofoam pad, it is not attached, anywhere. Transition strips of wood, metal or vinyl are used at doors, if the flooring changes to lino or ceramic tile, etc. 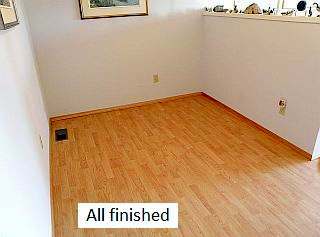 This is the ideal flooring for the home handy person to install. Just do a bit of preparation: read the instructions that come with each package; leave the packages wrapped up, in the room for 48 hours to acclimatize; remove existing baseboards and nails; scribe the first row, if the wall is bowed or not straight; prepare spacer blocks out of scrap 1/4" ply; get a short 2x4 about 18" long for a tapping block and go for it. 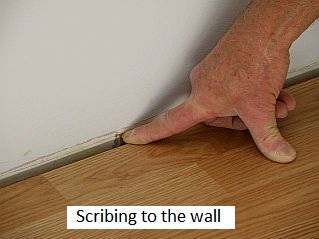 The tapping block is used to tap against the last row of laminate to get the joint absolutely tight together. If done correctly, it only needs a very slight tap. The joint on the ends and on the side should be tight together, if done correctly. Don't tap the block too hard and mushroom the tongue. Make sure there is nothing in the groove to prevent it from going together tightly. Some times a piece of HDF breaks off from the tongue and prevents the joint from tightening. I think I have covered everything. If not just send me a note. I have not seen these myself, either. I would guess the metal wrap incorporates the nailing flange, though. When I replaced older aluminum windows, I would, with my angle grinder with masonry wheel, cut the stucco about 1 1/2" away from the edge of the outside jamb. I would cut all away around the jamb, to the expose the outside of the nailing flange. I would carefully chip out the stucco from the jamb to my saw cut, remove the nails in the flange with a nail claw, remove the inside trim and casing and pop out the window. I would then replace the new window, nailing the flange back to its original position, against the sheathing. I can't think of any time I did this that I did not replace with a stock size of window. I found that we have 2 sizes of rough opening for windows, depending if they were made on the West coast or the East. One required 1" less than stock size, eg. for 2' x 3' the rough opening was 23 x 35. The other rough opening was the size of the stock size, 24 x 36. The actual size of the window for the first example is 1 1/2" less on the dimensions, that is 22 1/2 x 34 1/2. You want about 1/4" clearance all around. Getting into custom windows, as you know, is expensive. After installing the window, there is a space between the window jamb and the stucco. I install a wooden trim of 1x4 around the window, over the stucco, tight to the jamb. 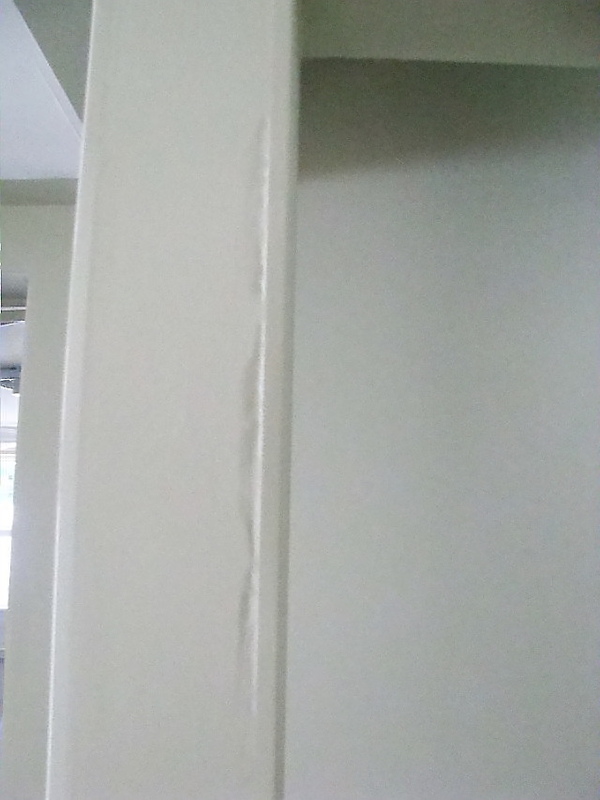 A bead of exterior latex caulking finishes the job. With the heat in New Mexico you could clad the 1x4 with flex flashing or use the plastic decking material. Isn't it fun going from one jurisdiction to another and put up with the different building codes in each one. Hi Dave, I hope everything went well. 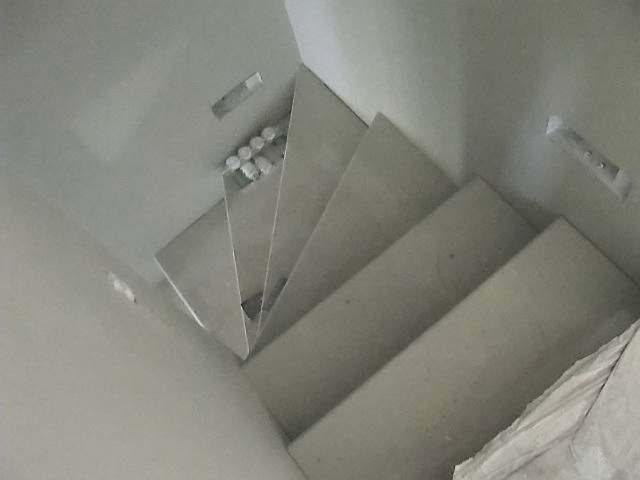 With your help and advice, my stair case project turns out very satisfactory. But I have some troubles with the drywall. As shown in the attached photos, with my finger, I can press down some spots of the outer corner beads, and leave dents there. My contractors have already painted the drywall. This looks to me that the corner bead was taped on, but not enough mud was used under it. First of all, is the corner bead taped on or is it metal corner bead nailed or screwed on? Yes, this is exactly what has to be done. Any bubble of tape that is loose should be cut out. Hopefully, enough tape is left to hold the corner bead secure, which looks the case. Yes, good references are important for contractors. This is unfortunate, but able to be corrected. Oh, make sure you prime the mud first before the finish coat. Drywall primer/sealer is an amazing product. It makes the soft finish of drywall mud into a hard protected surface. It also keeps the repaired surface from telegraphing through the finish paint. 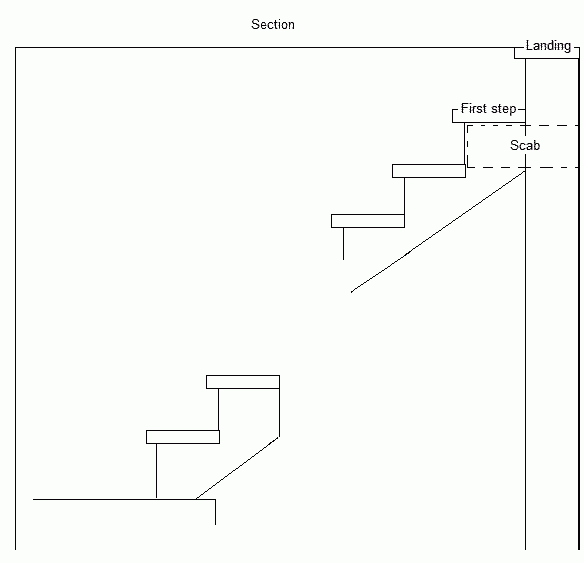 Hi Dave, Here is another question about my staircase. The first two pages of the attachment were taken of my current staircase. The treads are pine, and paint spilled over them. Note that my contractor didn't put skirt boards. I suppose most staircases need skirt boards to protect the walls, don't they? But at this point, I don't see how he can add the skirt boards. 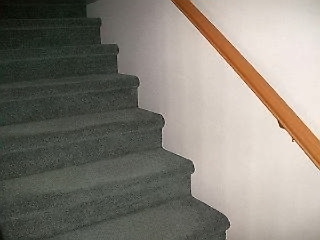 Stairways don't require skirts for protection, but are installed mainly for a trim feature. In my own stairway, I have hardwood on the outsides and carpet between. Against the wall, I have carpet going to the wall without a skirt. Attached are two photos of my stairs in comparison to the molding in place of a skirt. Notice the clean edge of the carpet and drywall joint. A skirt can be installed after the stringers and treads are in place, but it amounts to a lot of scribing and patience. Personally, I don't think it needs it. 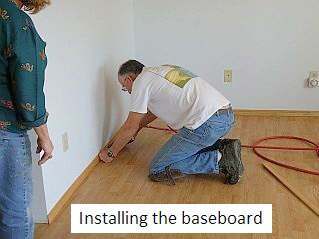 A good carpet installer can make the carpet cut against the wall, look good - no need for base. Hey Dave---great stuff here. Couple questions about cutting stringers. See attached picture. 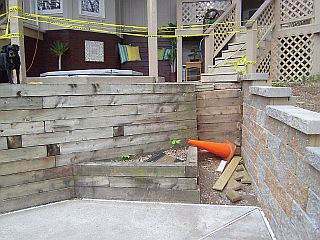 Replacing rotted set of stairs, and 2 stringers will be placed in the pocket seen in the picture. Question for this topic: Gathering that the calculator assumes that the first step begins one riser height below the landing surface. In my case, it's a busted piece of concrete. What kind of alterations should I make in order to make the first tread at the same level of the concrete? This is the way it was originally. (Have to fix the concrete anyway). Cutting 2 more stringers to extend the stairs all the way over on the angled wall you see in the picture. Assuming that I can situate the stringers with angled joist hangers, what alterations am I going to make in order to not only shorten the stringer, but to keep the treads level all the way across? Let me know if I'm not clear on anything. Rather than attach the stringers to angled joist hangers, I would make a tapered wood landing, flush with the top of the concrete, supported by vertical 2x4s or 2x6s. 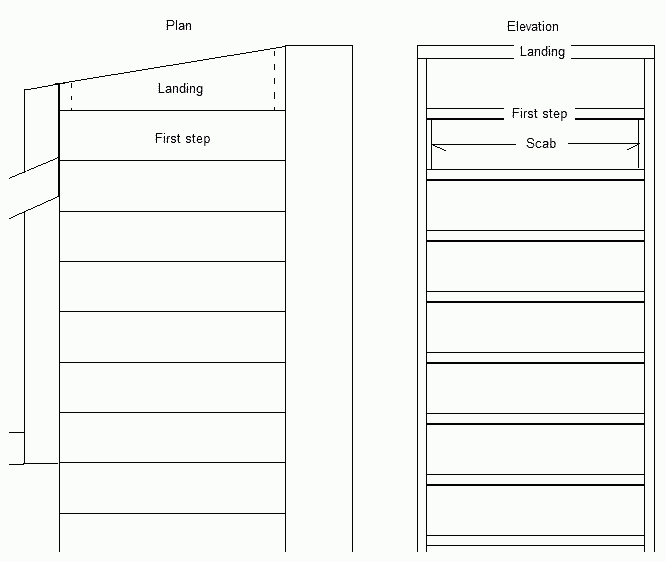 Then build the stairs square off that landing, start with the first step down a riser. The stringer can be toe-nailed to the 2x4 or 2x6, depending on how wide you need to have the landing to square it off. After toe-nailing, you can put a scab over the joint of the vertical 2x4 and the stringer. For extra strength, place a 2x4 post under the stringers at the high end and in the center. You should use pressure treated wood for the stringers and galvanized nails. Thanks for your continued questions, comments and good wishes.